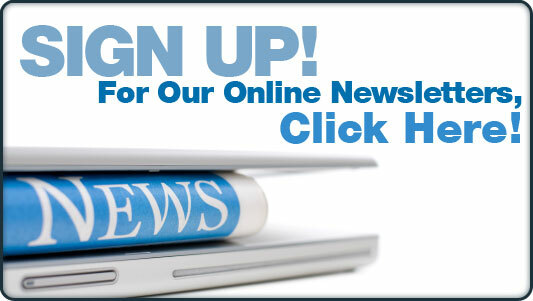 In an e-mail being widely circulated by Rick Warner DC, he outlines ongoing issues regarding the Florida Board of Chiropractic Medicine and online continuing education in that state. 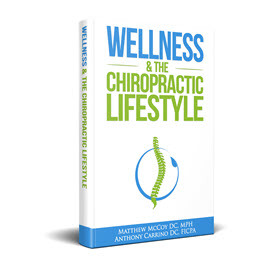 His attorneys have previously accused the chiropractic medicine board of an anti-competition stance in violation of both state and federal anti-trust statutes for which there could be both board, trade group and individual liability to those harmed. They refer to the Supreme Court Case: North Carolina Board of Dental Examiners v. Federal Trade Commission, 134 S. Ct. 1491 (2014). The Chair of the Florida Board of Chiropractic Medicine, Kevin Fogarty, DC also serves as the Chairman of the Board of Life University. This does not appear to be the first time the FBCM has acted in contravention to the Florida Department of Health. 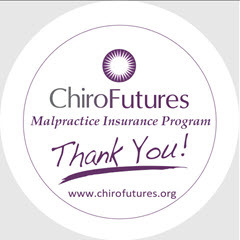 The Florida Board nixed a legislative package last year that would have removed a number of items restricting certain graduates from practicing in the state and also turned over the jurisprudence exam to the National Board of Chiropractic Examiners. This was after the Florida Department of Health told the Board of Chiropractic Medicine that they should eliminate the exam completely. The Florida Department of Health's recommendation on the National Board jurisprudence exam came through the form of a POSITION PAPER from Zohre Bahrayni, Ph.D titled: Moving the Laws and Rules Examination to Continuing Education. Instead the FBCM voted to add yet another examination and additional costs prior to licensure. Why would the Florida Board act in contravention to the Florida Department of Health on the NBCE issue? 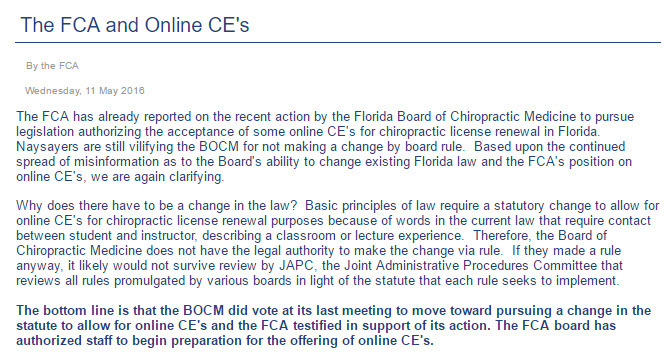 Florida chiropractors are now asking why the FBCM would act in contravention to its own counsel who stated they could in fact change the continuing education rule if they wanted to. I just read an article on the FCA website. The article is not signed, but it seems to me that whoever wrote it, worded the message very carefully to mislead the reader. 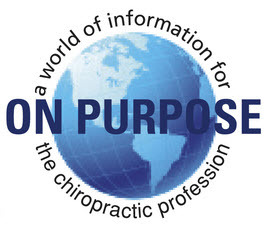 To begin with, if you weren't familiar with this scandal, and only read this article alone, you might think that the Florida Board of Chiropractic Medicine (FBCM) was proactively attempting to come in line with 45 other chiropractic state boards by allowing online CEs. 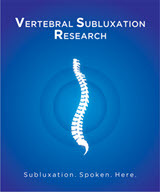 Online CEs are only at issue today because I hired an attorney and petitioned the FBCM at the April 8, 2016, FBCM meeting (along with approximately 1,300 other chiropractors) demanding that they take action to fix this problem. So, instead of "manning up" and doing what's right, the FBCM claimed it didn't have the authority to allow online CEs. The article on the FCA website claims this, too. The statute, as it reads now, says chiropractors need 40 "contact classroom" hours of continuing education every two years. Debra Loucks of the Florida Attorney General's Office was the legal advisor of the FBCM at the April 8, 2016, meeting. 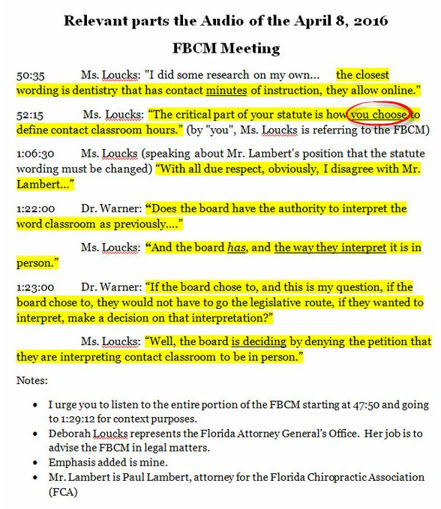 She told the board that they could interpret that wording ("contact classroom hours") to allow online learning, just the way the Dentistry board interpreted "contact minutes of instruction" to allow for online CEs. Now, I ask you...do you think that the Attorney General's stated opinion is a relevant fact in this issue? But, the FCA article completely ignores the Attorney General's legal opinion in the article. The FCA article goes on to say that a rule change would not survive the JAPC, the Joint Administrative Procedures Committee. 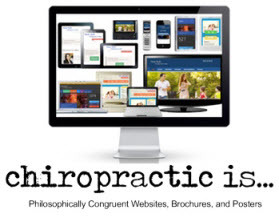 I ask you...why in the world would the JAPC care one iota if chiropractors were allowed to take courses online like other health professionals in the State of Florida? Here's my point. Unlike what the article is trying to make us believe, the FBCM doesn't need to go the legislative route to allow online CEs. Then, click on April 8, 2016 meeting audio. Then click on the third link. After that, click on the MP3 on the first link. P.S. My feeling is that the FBCM will string this thing out for as long as they can, and then, only when they have to, allow "some" online CEs.